In other words, don’t make any plans for the next two and a half days… In a mission to showcase the USAF’s long range strike capability, as well as participate in an exercise hosted by our Jordanian allies, two B-52’s departed Barksdale Air Force Base in Louisiana, and flew to Jordan to drop their bombs. That’s nearly 14,000 miles roundtrip! The two BUFF’s were in the air for 35 hours while participating in exercise Eager Lion with Jordanian Armed Forces. These types of missions happen fairly regularly, but it always amazes us when the distance and time are thrown out there. Way to go Team Barksdale! 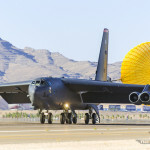 Two B-52 Stratofortress bombers assigned to the 2nd Bomb Wing at Barksdale Air Force Base, Louisiana, returned May 24 from a 35-hour, 14,000-mile nonstop mission to Jordan as part of this year’s exercise Eager Lion with Jordanian Armed Forces (JAF). Eager Lion is an annual U.S. Central Command exercise hosted by the Jordan government to test responses to conventional and unconventional threats in a joint environment. Exercise mission sets are based on a fictional adversary and range from border security, command and control, and cyber defense to battlespace management. Eager Lion 16 marked the second consecutive year of the integration of the multi-role, heavy bomber into the exercise. During the exercise, B-52 crews conducted air intercept training with Royal Jordanian Air Force F-16 fighter aircraft and executed a live conventional weapons demonstration directed jointly by JAF and U.S. ground controllers. The original article can be read in its entirety at AF.mil right here. BUFF: First Strike Against Daesh In Iraq! Stratofortress Trains With Colombian Air Force!